Some of the earliest European settlement in North America came as a result of the lush fishing grounds of the Grand Banks. Fleets of vessels came from many countries, including England, France and Spain. Seasonal communities sprang up along the coast, enabling fishermen to dry their catch of fish and produce salt cod, a staple in the European diet. Fishing was essential for the prosperity of coastal communities. Not only did it offer sustenance for local inhabitants, but it lead to thriving industry and trade. The Fisheries Museum of the Atlantic celebrates the rich history of Canada’s North Atlantic fishery. Located on the waterfront of the UNESCO world heritage seaport of Lunenburg, Nova Scotia, the Museum is ideally situated to bring seafaring history to life. The Museum began aboard the schooner Theresa E. Connor in 1967. Since that time, it has grown to include a large complex of historic buildings, with an impressive aquarium, theatre, exhibits and additional vessels, including the side trawler Cape Sable. 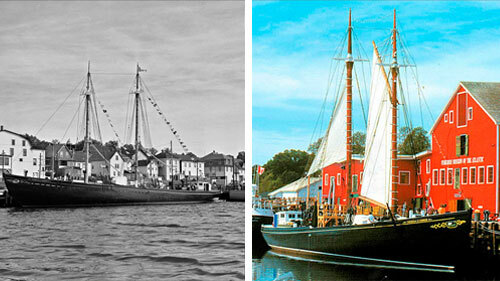 Theresa E. Connor, Canada’s oldest saltbank schooner, continues as the flagship of the Museum.